There is no menu at our restaurant and many people are taken aback when they come to know about it. Many of them have to wait for an hour or so while we cook the food and serve in the morning hours. But then we wait for the villagers to come everyday in the market, buy whatever they bring and cook the same in the restaurant, so we really can't have a fixed menu. This is so heart warming when a restaurateur says that they cook whatever they get in the market. I believe in cooking whatever is in season and whatever the villagers brings to the market after foraging and from their small patches. 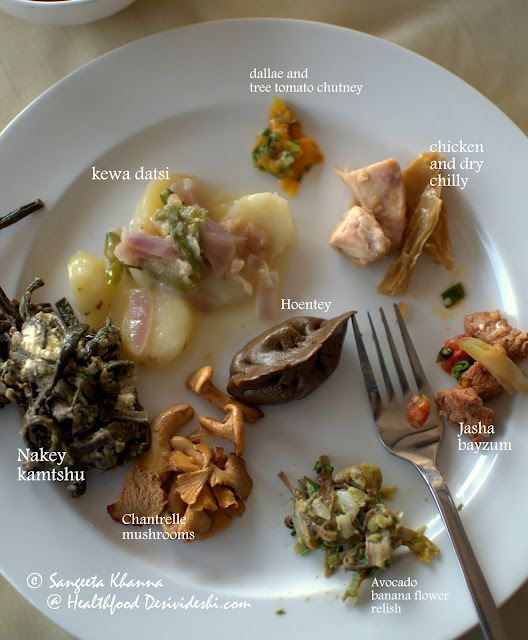 Most of our guests love this, says Kesang Choedon who runs the Folk Heritage Restaurant at the Folk Heritage Museum at Thimphu, Bhutan. We were dreaming of this Folk Heritage Museum while making plans to visit Bhutan while we absorbed what she said. I was reminded of the Kunga restaurant in Darjjeeling where we climbed the steps one morning and found the women cleaning local greens and one helper chopping meat behind the counter. We requested for food and were asked to wait for an hour before they cleaned the greens and cooked it for us. That was one of the best meals we still remember. And now we are already planning to go to Bhutan just to meet this soft spoken lady again. She is so soft spoken it is impossible to believe that Kesang Choedon was in Bhutan Police for 20 years and decided to switch over to folk heritage food of Bhutan. She says she learnt about the regional and forest foods and culinary traditions while traveling during her police days. The way the women would sun dry vegetables and collect wild ferns, use them fresh and sun dry any extra to be cooked later. Kesang learnt cottage cheese making too and told us that Bhutanese cottage cheese is different from what we know as cottage cheese. Raw milk is collected and kept for a couple of days till it curdles, then it is churned to collect butter and the remaining whey is cooked and curdled cheese is collected and made into round blocks to use or to barter or sell. The remaining warm whey is considered and tasty drink and Kesang told they exchange their vegetable peels with the villagers to get the warm whey. How fascinating is that? 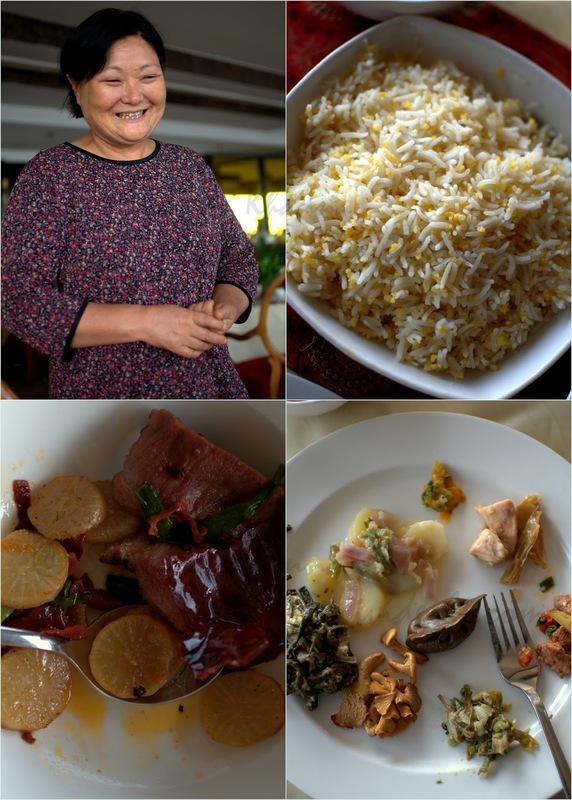 We were getting hungry while she told stories about Bhutanese food at the top floor Le Belvedere at Le Meridien Hotel. She vanished to cook a sampler meal for us and we waited eagerly, sipping some Jasmine tea. There is no concept of courses on Bhutanese cuisine but there are various condiments served with the meal that can leave you asking for more. Just do not go by how the food looks, as looks can be deceptive. And one lesson you learn after eating food from the mountains is, that the limitation of ingredients doesn't limit the taste of the food. 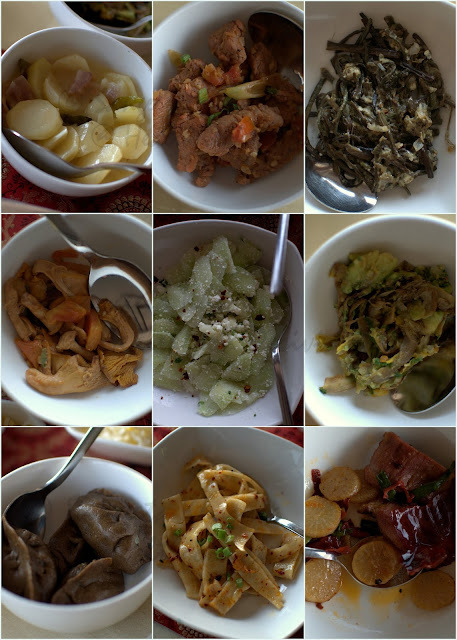 This Bhutanese spread was a testimony to that. 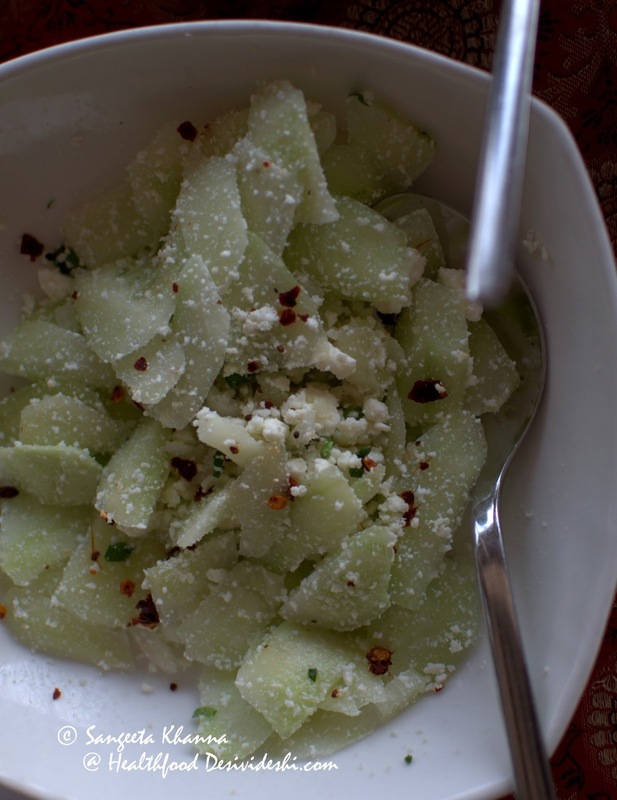 A very interesting cucumber and cottage cheese salad, Geon Hogey was quite refreshing. The cheese was brought from Bhutan and I found this crumbly cheese very different from any cheese I know. But since it is a buttermilk cheese, the taste was slightly tart that complements the salad along with chilli flakes. 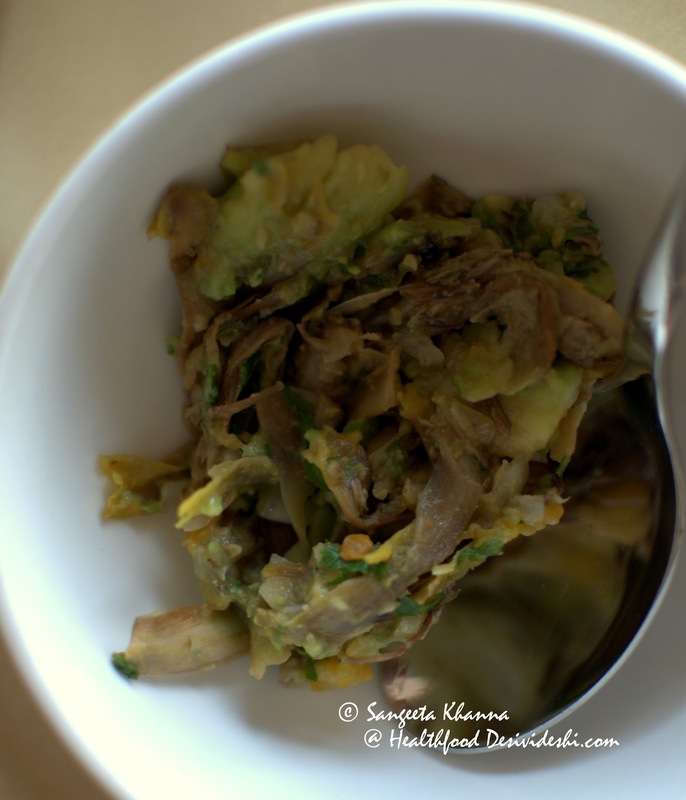 The famous Aema datsi, blanched chillies with cheese is the national dish of Bhutan. 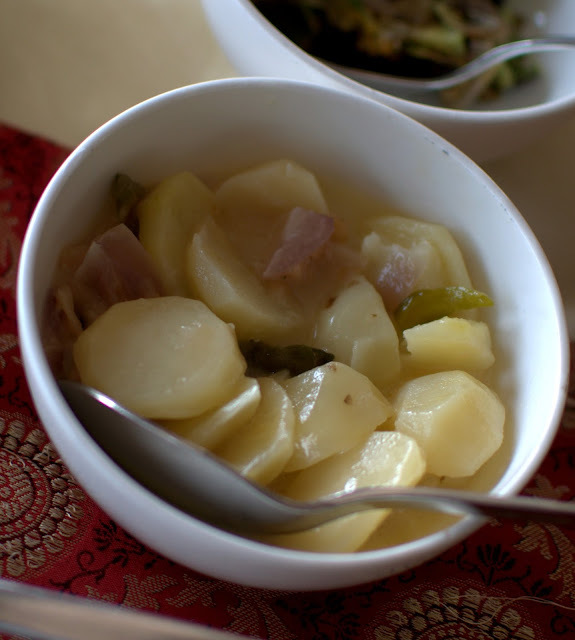 We tasted the potato version called Kewa datchi and it was creamy soft and mild hot with a few bits of red onion. This is essentially a cheese potato chilly stew is something very few people can resist. 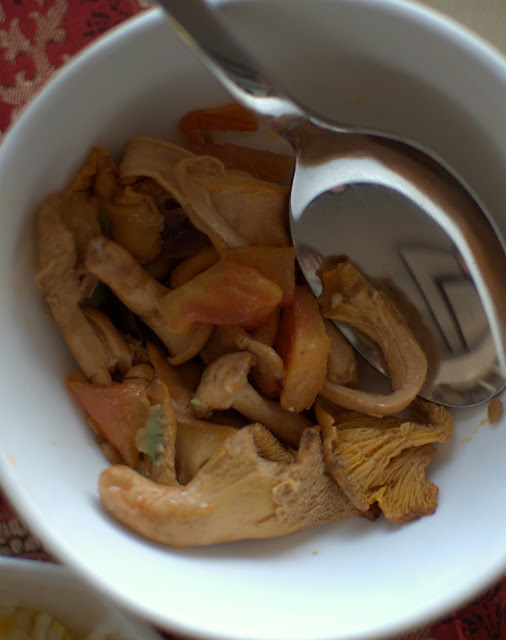 I liked the dried mushroom relish (Chantrell mushrooms with cheese) and Jasha Bayzum (boneless chicken in tomato and spring onion stew), the chillies being subtle and flavourful in each of these dishes. The real flavour comes form the use of various types of chillies and some or the other dried ingredients that brings a new taste magically. 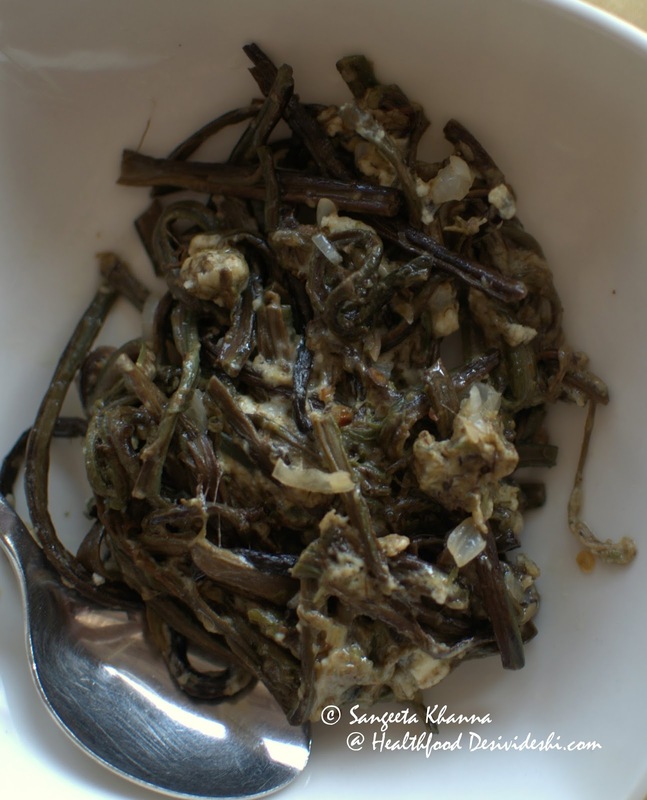 Talking of sun dried ingredients, we tasted a dried fern (Fiddle head fern) cooked with cheese, onions and chillies called Nakey Kamtshu, and though the texture was leathery the overall taste was very interesting. I loved it and asked Kesang about it. She told these ferns are cooked fresh when in season and are sun dried and stored for later use. The sun dried version has a different flavour and people use this version when they miss eating fish in winters. This Nakey Kamtshu has a potent umami flavour that they relish when they crave for fish quite understandably. Another very interesting relish was a mash of Avocado and raw banana flowers wit dallae chillies that Chef Kesang whipped for us. I would have never imagined combining these ingredients but now I know I will be trying it some day. She also made a hot chilli chutney for us that was very familiar. 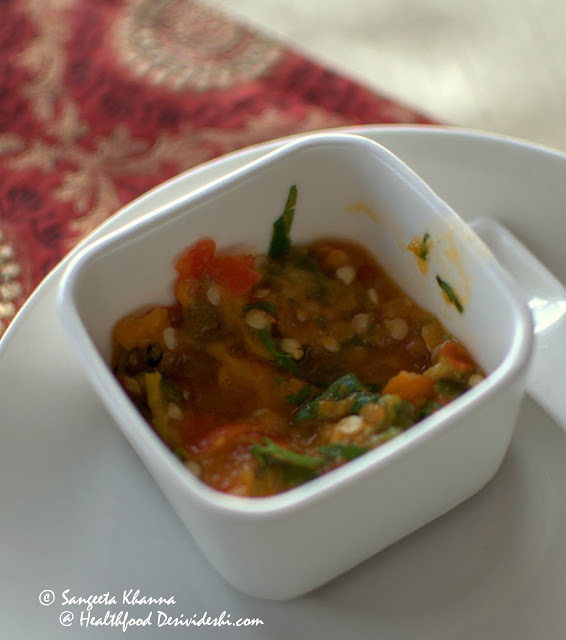 This tree tomato and dallae (Sikkimese/Bhutanese round chilli) chutney with shezuan peppers and torn spring onions was hot but oh so delicious. And now I will tell you about this pork called Shakam pa, cooked with radish slices, spring onion and and a sweet red chilli variety. Very unusual for us but very flavourful and delicious, the pork was a bit chewy but the flavours so well balanced and unique. Here is how my plate looked. I took second helpings of the Nakey kamtshu, hot dallae chutney and Avocado mash. The Hoentey or the buckwheat momo shaped dumpling too was very interesting. It was stuffed with dried turnip greens, radish, cheese and mustard mix and inspired me to cook more with buckwheat flour. The rice was cooked with corn grits but Bhutanese kitchens use corn grits instead of rice as the main course staple mostly. You see I can go on and on about how I love this cuisine and most importantly talking to Chef Kesang who feel shy being called as Chef. 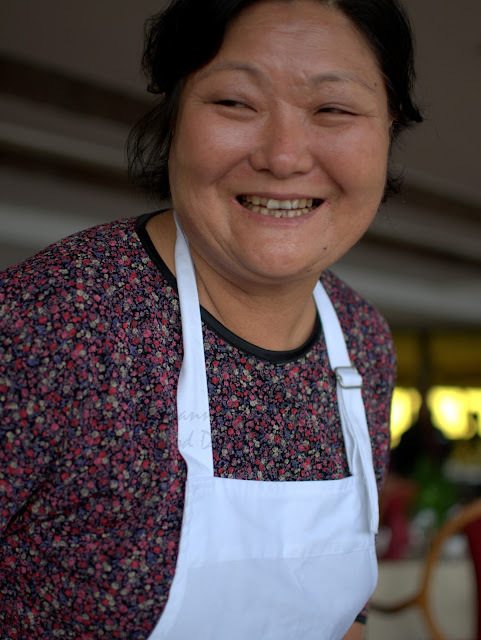 She runs the Folk Heritage restaurant efficiently and passionately, we could sense that while talking to her. We made a promise to visit her when we go to Bhutan. 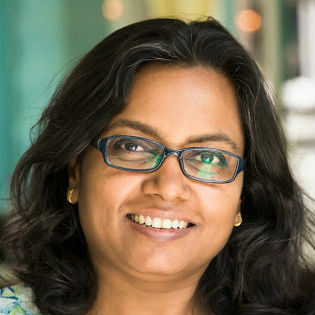 Hello Sangeeta, this is such an interesting post. I wish I had known about the Folk Heritage restaurant when we visited Bhutan in August,2013. I did have Ema Daittshi but did not discover anything much on our short visit. Though I did buy the local cheese, buckwheat flour and plenty of apples. The last was in season. That was a quick comment Kanak :-) Thank you. Luckily I know what I will be doing when I visit Bhutan and yes the apples and cheese will be on my list of course. We get buckwheat here easily. Yes Rebecca. 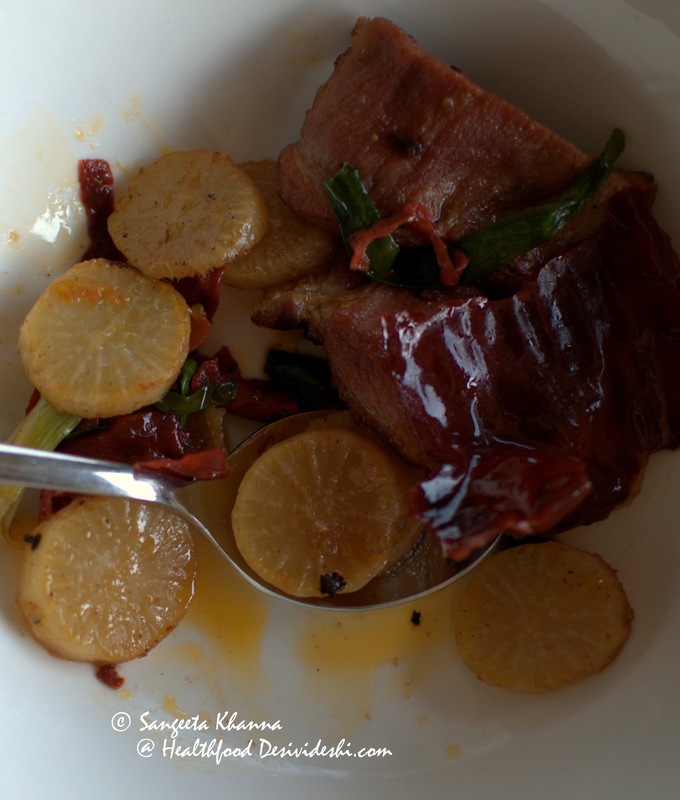 Bhutan is a beautiful country and the food is amazing too.